Multi Card Keno Guide & Review - Casino Answers! Multi-Card Keno is an online keno game developed by Slotland software, featuring multi-card keno play. You can play Multi-Card Keno at WinADay Casino. It’s one of the most popular variations of Keno you will find online honestly. It was created quite a few years ago and has really changed the game of Keno. Keno itself is fun enough but the multi card keno variant really adds a lot of excitement to the game and I am really surprised we haven’t seen more of it. 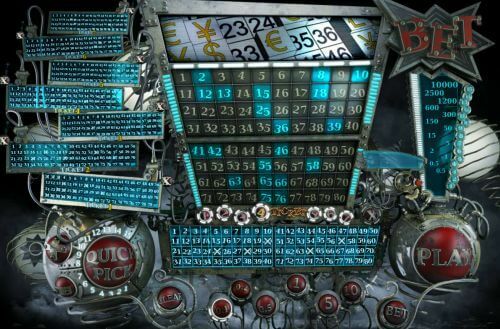 The Multi-Card Keno layout is a machine-type format with lots of wires, cables, tubes and cogs of different sorts. When numbers are hit, they will light up. On the left side of the screen, you will see your 7 keno tickets. On the right side, the payouts will be listed. In the center is the keno board itself where you will see the results of the keno round. Below that, you will see the numbers 1-7 where you can select which ticket you want to pick the numbers on. The quick pick feature is located near the bottom-left. Music and sound effects are playing at all times. You can bet $0.10, $0.20, $0.50, $1, $5 or $10 per card on Multi-Card Keno. To play, you must first select your bet. You must bet the same amount on each keno ticket. The next step is to select the appropriate keno ticket. For Ticket #1, select the number 1 below the keno board in the center and then select between 1-15 numbers. You can choose them yourself or you can use the “Quick Pick” button at the bottom-left of the game screen. You can use the “+” and “-” buttons to decrease the number of quick pick numbers you wish to play. To play more than one ticket, repeat the steps for up to six more tickets. To turn off a ticket, hit the “X” button in the corner of the ticket(s) or select that ticket’s number below the keno board and hit the “X” next to the ticket numbers. Once you are ready to play Multi-Card Keno, hit the “Play” button near the bottom-right of the game screen. After the game ends, the number of hits per ticket along with your winnings will be listed on the ticket. If you play all 15 numbers and hit all of them, you can win up to 10,000X your bet on Multi-Card Keno. On a 15 number game in Multi-Card Keno, the payouts are as follows: 3 (0.5), 4 (0.5), 5 (1), 6 (2), 7 (5), 8 (15), 9 (50), 10 (150), 11 (300), 12 (600), 13 (1200), 14 (2500) and 15 (10,000). Hit the Clockwise Arrow button to open Multi-Card Keno’s autoplay mode. You can play 5, 10, 25, 50 or 100 autoplay rounds. To speed the game up, you can choose to turn off winning animations. You can stop autoplay on Multi-Card Keno at any time. Multi-Card Keno is an interesting variation of online keno that lets the player play multiple sets of numbers on up to seven tickets. You can’t find Multi-Card Keno at every online keno, but you can find it when you sign up and deposit at WinADay Casino! Can I play a free Flash game of Multi-Card Keno? Yes, absolutely. There is no software to download at WinADay Casino, so all of the games are played in your browser with no download required. If I’m in the United States, can I play Multi-Card Keno for real money? Yes, American players are welcome to play all of the games at WinADay Casino including Multi-Card Keno and many more.